This hot asphalt mix is the most common mix used because it can provide great impermeable characteristics allowing water to run away from the surface area. The name comes from the aggregate size used while mixing the raw materials to produce the asphaltic composition. It can also be subdivided as fine-graded or coarse-graded, depending on the majority of the aggregates in the final product. This type of asphalt is ideal for all traffic conditions and has great performance under structural conditions, friction, and for surfacing and repairing needs. This mix was developed to maximize rutting resistance and to have great durability. Due to the process of production, this asphalt mix is more expensive than regular dense-graded mixes. Its design is based on higher asphalt content, modified asphalt binder, and fibers. This asphalt type has been used since the 1980s and can be used in numerous road and driveway applications. Due to its high costs, it is recommended to be used on high volume interstate highways to get benefits from its durability and endurance. It will also increase the driver’s safety due to the impressive friction capabilities with tires; it will also minimize tire noise and will reduce reflective cracking. Mineral fillers and additives are used to minimize asphalt binder drain-down during construction while increasing the amount of asphalt binder used in the mix and to improve mix durability. Open-graded friction course - Air voids minimum requirement are 15%, and no maximum air void percentage is specified. This mix is only used for surface courses. It has a smoother surface finish than the dense-graded. Its low cost of placement counteracts the high cost of producing it. However, make sure that you are not clogging or sealing the pores as this action will dramatically reduce and degrade asphalt performance and stability. Now that you know the main three asphalt types, you need to be aware of the following tips during the construction process. First of all, the hot mix asphalt shall be transported from a nearby plant to the job site, and the closer the better to maintain proper temperatures. Be sure to add a non-petroleum based product to your truck bed to avoid the mix from sticking to the truck surface. 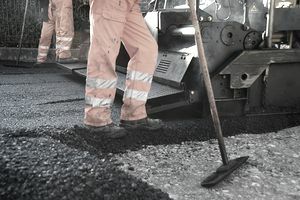 It is recommended to prepare the surface before placing the new asphalt mix by milling the area. The process will remove old surfaces while providing a better grip area for the new layer of asphalt being placed. An added benefit of the milling process is that it will allow water to flow properly to curb and gutters by maintaining the drainage characteristics of the area and road surface. The compaction process needs to be carefully done to avoid pavement deterioration and should start while the mix is still hot for better results. Use pneumatic or steel rollers for better results. Be sure to check asphalt density before finishing to determine whether or not traffic can be allowed on the pavement surface.